World leaders celebrated major milestone in empowering 10 million marginalized out of school children through quality education. Her Highness Sheikha Moza bint Nasser, UN Secretary General António Guterres and leaders from the United Nations, NGOs, and global industry, including President of Ghana and model philanthropist Naomi Campbell, celebrated an important milestone in addressing a growing global challenge. Her Highness Sheikha Moza Bint Nasser, UN SDG advocate and Founder and Chairperson of Education Above All (EAA) Foundation, alongside partners, announced that 10 million out of school children in some of the most challenging situations around the world, will receive quality primary education. Qatar - Doha, 29 April, 2018: Her Highness Sheikha Moza Bint Nasser, UN SDG advocate and Founder & Chairperson of Education Above All (EAA) Foundation, alongside partners, promised in year 2012 to achieve the milestone of reaching out to 10 million marginalised out of school children in some of the most challenging situations around the world within 5 years. EAA Foundation, through its programme Educate A Child (EAC), and its partners from all over the world recently major milestone in empowering 10 million marginalized out of school children through quality education, during a special event at the New York Public Library, in New York City. The event was attended by Her Highness Sheikha Moza bint Nasser, UN Secretary General António Guterres and leaders from the United Nations, NGOs, and global industry, including President of Ghana and model philanthropist Naomi Campbell, to celebrate an important milestone in addressing a growing global challenge. Reflecting Education Above All (EAA) Foundation’s global movement and successful milestone in Qatar to raise awareness about EAA’s achievements and work worldwide, EAA Foundation partnered with highly recognised organisations by lighting major buildings in Doha (Partners buildings). These buildings included Museum of Islamic Art; Qatar Foundation; Ministry of Education; Aspire – the Torch building; Doha Tower; Lusail bridge; and W Hotel Doha. By using the hashtag #Togetherfor10million and introducing the hashtag #ItIsPossible, the event created buzz for the right cause among the masses, and further helped in building momentum from New York to Qatar with local celebrations taking place in different locations all over Qatar. With over $1.8 billion leveraged3, EAC has already enrolled over 6 million children worldwide in areas affected by poverty, discrimination, natural disaster, and conflict. 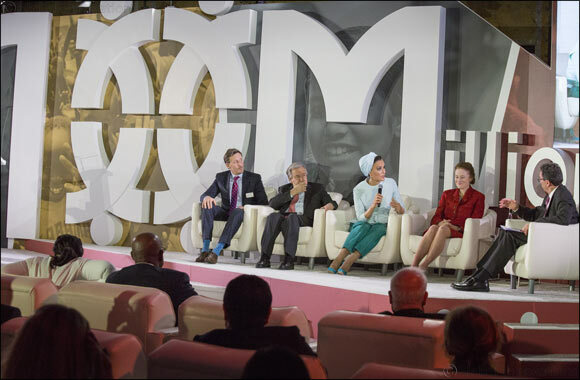 Securing commitments to reach 10 million fulfils Sheikha Moza’s 2012 promise and demonstrates that progress is possible, even amid the worsening education crisis. EAC works side-by-side with children, their families, communities, governments and partners, to identify barriers to education and support children to overcome them. This successful partnership approach allows for EAC to take local knowledge and expertise from the community itself and scale it up using multi-sector solutions. • Children living in severe poverty and may have to work instead of going to school, such as children in domestic labour in Haiti.